I am sorry we have written this terrible, sad thing. It's probably @missveryvery's fault. We'll be at ECCC this year so if you're there, come find us and say hi! 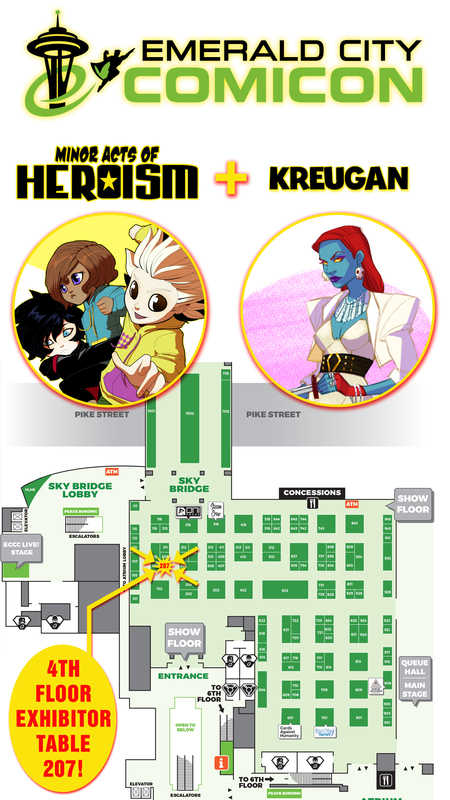 We're Booth 207 in the exhibitor hall and we'll have the lovely Kreugan selling there too! Click the map below for ease of finding us! 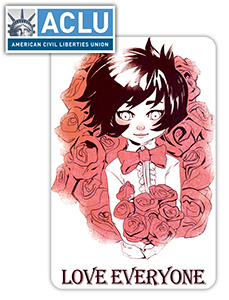 We're still doing a charity fundraiser (we'll have these at ECCC too)! We've got this adorable Sergio postcard available! All proceeds will be donated to the ACLU! Check it out in the SHOP! I feel like this is something he did 'for her own good' or to 'teach her the cruelty of the world' or some such nonsense. Regardless of intent, still a bad thing to do. I wonder if his overthrow (which we know happened) was part of this plan: get them to accept Naima as King because she overthrew the usurper. As a heroine, her demi-god status is far less a liability. And the King being a demi-god is probably less jarring in people's minds than a demi-god royal existing who isn't on top. As silly as that is. Naima... I'm really looking forward to seeing where this goes from here but poor Naima. Augh! It's really a testament to the strength of the art and the writing that we all knew this was coming, but it's still such a gut punch. The drama of the first panel is great though. I know it's ridiculous, but I was holding out on this baseless hope that they weren't dead. Like Zakris sent them to another dimension or something, lol. But I still like Zakris. The demigods were being oppressed, and so he cracked the world's shell and revolutionized the heck out of it. And sure he was living what seemed to be a life of luxury (ostracized from people), but that's because his mom was royalty. What about the other demigods who were imprisoned? I'm sad for Naima, and I really wish Zakris had just sent everyone to another dimension (crazy wishful thinking, lol). But I still love both of them. Can't wait to see what happens next.